It has been kindly brought to my attention this morning that an image of myself and Rosie is being used in the USA for a 'pro-life' article fiercely campaigning against abortion. I'd like to state that if you see any articles or images of myself and Rosie being used to back up an argument either for or against abortion then it is without my consent. I strive to give people informed choice and nothing else. 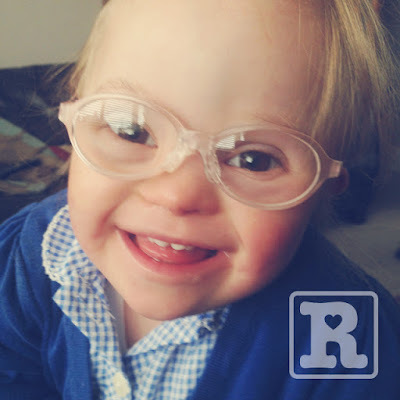 I am in no position (or even wish to be) to judge people of their choices – all I hope is that when a diagnosis of Down's syndrome is confirmed pre-natally that parents can make an informed decision. The fact my wife and I chose to continue with the pregnancy in no way means we judge anyone on choices they make. If you come across such articles I'd appreciate a nudge. The journalist in question has even gone to the trouble of cropping off the watermarks I have in place to let people know they aren't for random use! Anyway....It's been a while since I posted on here – I will be writing an update on Rosie very soon I promise! In the meantime I'll leave you with a picture of our little Bud in her posh new glasses! Thank you so much (as always) for all of your support.